Large Voltage marker labels are a great way to make a big impact. Label pipes, valves, and electrical boxes with this bold orange markers that stand out on all of your equipment. 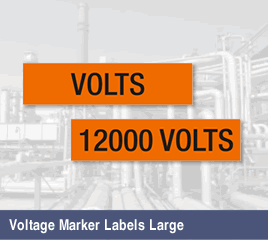 Know you voltage at a glance with a bigger label design. • Choose from a number of voltages (or write in your voltage) and other messages for your equipment. The labels were exactly what we wanted and they worked great. Works for the application we need. We keep reordering this style so they definitely work.